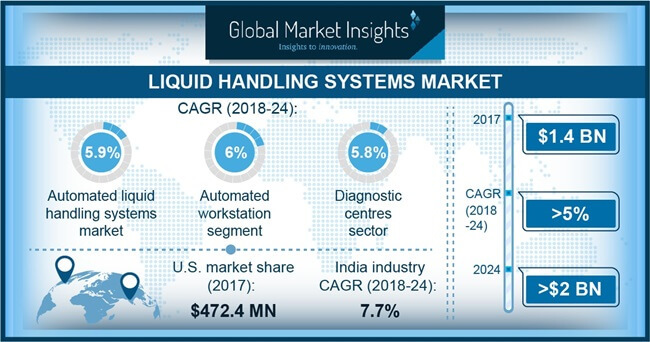 Liquid Handling Systems Market size is set to exceed USD 2.0 billion by 2024; according to a new research study published by Global Market Insights, Inc.
Increasing incidence of infectious diseases along with growing demand for high-throughput diagnosis of such diseases is boosting the liquid handling systems market. Increasing application of various laboratory processes such as PCR, ELISA, array printing, plate replication, serial dilution, cell culture and whole genome amplification is also boosting the industry growth. Presence of huge number of pharmaceutical companies as well as strong biotechnology sector in developed countries such as U.S., Germany and Japan are enhancing market growth. In addition, adoption of automated liquid handling devices in such countries for biomedical research is helping in the elimination of pipetting errors, hence maximizing accurate results. All these factors will increase the opportunity for the growth of liquid handling systems market in these regions. High cost and complexities associated with the management of automated liquid handling devices is one of the factors responsible for impeding the liquid handling systems market growth over the projection years. In addition, lack of skilled resources in developing as well as under-developed countries is another obstacle, that might pull back the industry growth. Automated liquid handling systems market segment is anticipated to experience robust growth in the future, accounting for USD 580.4 million in 2017. Automated systems have maximum accuracy, that helps to eliminate manual pipetting errors, thereby maximizing the reproducibility of assays. In addition, growing demand for such automated devices with unique software allows healthcare professionals and medical researchers to set-up even complex tasks with minimal efforts, thereby driving the market growth of the segment. Liquid handling automated workstation market is expected to grow at 6.0% during the projected years from 2018-2024. Automated workstations provide consistent results for assays, enhanced performance along with integrated sample storage and customization option for any specific usage, that will increase its application in coming years. In addition, automated workstations measure out samples and reagents, ensuring that liquids are added to bioassays in a uniform manner, thereby propelling its market growth. Pharmaceutical & biotechnology industry market segment accounted for USD 635.5 million in 2017. The market share is attributed to increasing incidence of infectious and lifestyle-related diseases, growing demand for potent vaccines and rising number of clinical trials globally. Moreover, pharmaceutical and biotechnology industry make use of automated liquid handling systems to ensure that there is a proper workflow between their processes ranging from serial dilution to PCR, hence driving the market segment growth. U.S. liquid handling system market is estimated to grow at a CAGR of around 4.6% over the forecast period. Growing application of PCR, next-generation sequencing, microarray, and ELISA coupled with presence of industry players like Danaher Corporation, Qiagen, Beckman Coulter, and Thermo Fisher Scientific, Inc. will serve as a high impact rendering factor for revenue growth in the U.S. Moreover, shift in trends towards therapeutic areas such as women's health, oncology, infectious disease and HIV/STDs testing along with growing incidence of infectious diseases will enhance industry growth in the U.S.
Germany liquid handling systems market dominated the European region in 2017 and is expected to grow at 4.4% during the forecast timeframe. Increasing number of infectious diseases, and availability of technologically advanced manufacturing capabilities are few factors driving the market growth. Rapidly evolving techniques in molecular biology, high stage of sophistication in healthcare sector and scientific biomedical applications, improvements and innovative approaches in technology will propel the industry growth over the forecast period. Prominent industry players include Gilson Incorporated, Tecan, Hamilton Co., Eppendorf AG, Thermo Fisher Scientific, Inc., Sartorius and others. These market players have adopted innovative strategies such as new product development, improving their manufacturing footprint, merger and acquisition, and geographical expansion for improving their position in the market place.